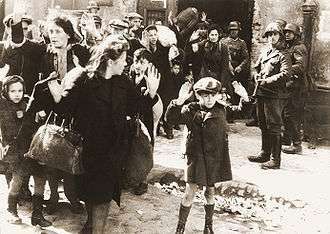 Warsaw Ghetto Uprising. Photo from Jürgen Stroop in a report to Heinrich Himmler from May 1943. The original German caption reads: "Forcibly pulled out of dug-outs". 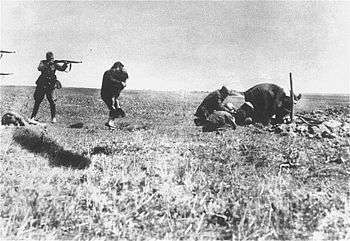 The only person subsequently identified with certainty in the photograph is Josef Blösche the SS soldier with the gun. The governments of the German Empire and Nazi Germany ordered, organized and condoned a substantial number of war crimes in World War I and World War II respectively. The most notable of these is the Holocaust in which millions of people were systematically murdered or died from abuse and mistreatment. Millions also died as a result of other German actions in those two conflicts. The true number of victims may never be known, since much of the evidence was deliberately destroyed by the perpetrators in an attempt to conceal the crimes. Considered to have been the first genocide of the 20th century, the Herero and Namaqua Genocide was perpetrated by the German Empire between 1904 and 1907 in German South-West Africa (modern day Namibia), during the scramble for Africa. On January 12, 1904, the Herero people, led by Samuel Maharero, rebelled against German colonialism. In August, General Lothar von Trotha of the Imperial German Army defeated the Herero in the Battle of Waterberg and drove them into the desert of Omaheke, where most of them died of thirst. In October, the Nama people also rebelled against the Germans only to suffer a similar fate. In total, from 24,000 up to 100,000 Herero and 10,000 Nama died. The genocide was characterized by widespread death by starvation and thirst because the Herero who fled the violence were prevented from returning from the Namib Desert. Some sources also claim that the German colonial army systematically poisoned desert wells. Documentation regarding German war crimes in World War I were subsequently seized and destroyed by Nazi Germany during World War II, after occupying France, along with monuments commemorating their victims. Poison gas was introduced by Imperial Germany, and was subsequently used by all major belligerents in the war against enemy soldiers, in violation of the 1899 Hague Declaration Concerning Asphyxiating Gases and the 1907 Hague Convention on Land Warfare, which explicitly forbade the use of "poison or poisoned weapons" in warfare. In August 1914, as part of the Schlieffen Plan, the German Army invaded and occupied the neutral nation of Belgium without explicit warning, which violated a treaty of 1839 that the German chancellor dismissed as a "scrap of paper" and the 1907 Hague Convention on Opening of Hostilities. Within the first two months of the war, the German occupiers terrorized the Belgians, killing thousands of civilians and looting and burning scores of towns, including Leuven, which housed the country's preeminent university, mainly in fear of Belgian resistance fighters, or francs-tireurs. 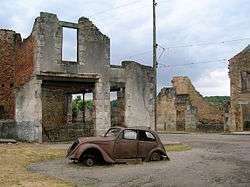 This action was in violation of the 1907 Hague Convention on Land Warfare provisions that prohibited collective punishment on civilians and looting and destruction of civilian property in occupied territories. The raid on Scarborough, Hartlepool and Whitby, which took place on December 16, 1914, was an attack by the Imperial German Navy on the British seaport towns of Scarborough, Hartlepool, West Hartlepool, and Whitby. The attack resulted in 137 fatalities and 592 casualties. The raid was in violation of the ninth section of the 1907 Hague Convention which prohibited naval bombardments of undefended towns without warning, because only Hartlepool was protected by shore batteries. Germany was a signatory of the 1907 Hague Convention. 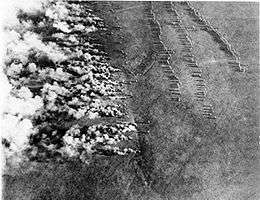 Another attack followed on 26 April 1916 on the coastal towns of Yarmouth and Lowestoft but both were important naval bases and defended by shore batteries. Unrestricted submarine warfare was instituted in 1915 in response to the British blockade of Germany in the North Sea. Prize rules, which were codified under the 1907 Hague Convention—such as those that required commerce raiders to warn their targets and allow time for the crew to board lifeboats—were disregarded and commercial vessels were sunk regardless of nationality, cargo, or destination. Following the sinking of the RMS Lusitania on 7 May 1915 and subsequent public outcry in various neutral countries, including the United States, the practice was withdrawn. However, Germany resumed the practice on 1 February 1917 and declared that all merchant ships regardless of nationalities would be sunk without warning. 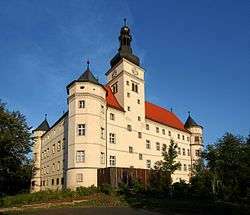 This outraged the U.S. public, prompting the U.S. to break diplomatic relations with Germany two days later, and, along with the Zimmermann Telegram, led the U.S. entry into the war two months later on the side of the Allied Powers. it should be noted that, as far as wartime actions against enemy nationals are concerned, the  Genocide Convention added virtually nothing to what was already covered (and had been since the Hague Convention of 1899) by the internationally accepted laws of land warfare, which require an occupying power to respect "family honors and rights, individual lives and private property, as well as religious convictions and liberty" of the enemy nationals. But the laws of war do not cover, in time of either war or peace, a government's actions against its own nationals (such as Nazi Germany's persecution of German Jews). And at the Nuremberg war crimes trials, the tribunals rebuffed several efforts by the prosecution to bring such "domestic" atrocities within the scope of international law as "crimes against humanity." 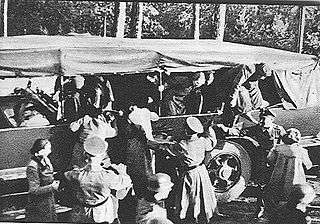 German mistreatment of Soviet prisoners of war — at least 3.3 million Soviet POWs died in German custody, out of 5.7 million captured; this figure represents 57% POW casualty rate. 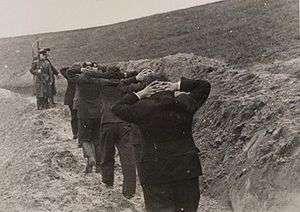 Le Paradis massacre, May 1940, British soldiers of the Royal Norfolk Regiment, captured by the SS and subsequently murdered. 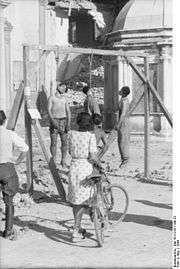 Fritz Knoechlein tried, found guilty and hanged. 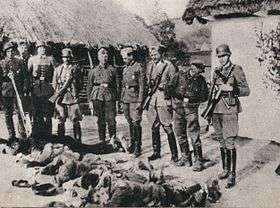 Wormhoudt massacre, May 1940, British and French soldiers captured by the SS and subsequently murdered. No one found guilty of the crime. 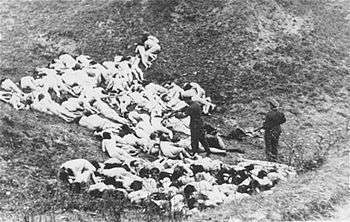 Lidice massacre after assassination of Reinhard Heydrich in 1942, when the Czech village was utterly destroyed, and inhabitants murdered. 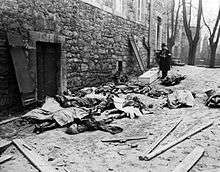 Malmedy massacre, December 1944, United States POWs captured by Kampfgruppe Peiper were murdered outside of Malmedy, Belgium. Wereth massacre. 17 December 1944, soldiers from 3./SS-PzAA1 LSSAH captured eleven African-American soldiers from 333rd Artillery Battalion in the hamlet of Wereth, Belgium. Subsequently, the prisoners were shot and had their fingers cut off, legs broken, and at least one was shot while trying to bandage a comrade's wounds. Unrestricted submarine warfare against merchant shipping. The intentional destruction of major medieval churches of Novgorod, of monasteries in the Moscow region (e.g., of New Jerusalem Monastery) and of the imperial palaces around St. Petersburg (many of them were left by the post-war authorities in ruins or simply demolished). The campaign of extermination of Slavic population in the occupied territories. Several thousand villages were burned with their entire population (e.g., Khatyn massacre in Belarus). 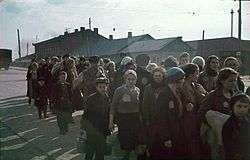 A quarter of the inhabitants of Belarus did not survive the German occupation. Commando Order, the secret order issued by Hitler in October 1942 stating that Allied combatants encountered during commando operations were to be executed immediately without trial, even if they were properly uniformed, unarmed, or intending to surrender. Khatyn Memorial. 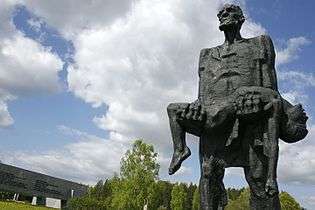 The sculpture depicts Yuzif Kaminsky, the only adult to survive the massacre, holding his dead son Adam. In addition, more than 90 villages and towns are recorded from the Hellenic network of martyr cities. During the triple German, Italian and Bulgarian, occupation about 800,000 people lost their lives in Greece (see World War II casualties). A body lies in the via Rasella during the round up of civilians by Italian collaborationist soldiers and German troops after the partisan bombing on 13 March 1944. 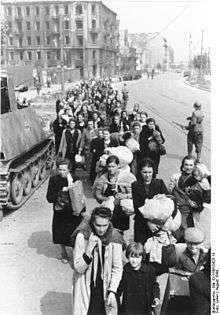 A column of Polish civilians being led by German troops through Wolska Street in early August 1944. 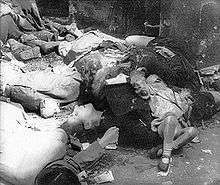 Film footage taken by the Polish Underground showing the bodies of women and children murdered by SS troops in Warsaw, August 1944. Asperg. 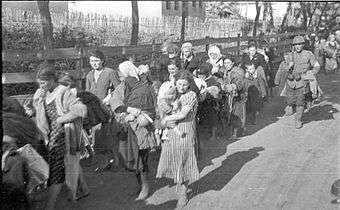 Sinti and Roma people about to be deported, 22 May 1940. Asperg. 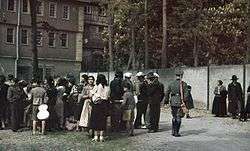 Sinti and Roma children about to be deported, 22 May 1940. Iaşi. Jewish bodies, 29 June 1941. Reichskommissariat Moskau. Jewish women and children been forced out of their homes. A soldier in Romanian uniform is marching along as a guard, 17 July 1941. 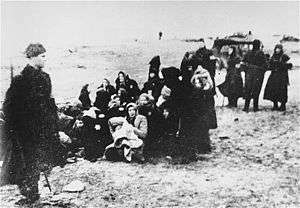 Members of the 21st Latvian Police Battalion assemble a group of Jewish women for execution on a beach near Liepāja, 1941. Warsaw Ghetto Uprising – Photo from Jürgen Stroop Report to Heinrich Himmler from May 1943. The original German caption reads: "Askaris used during the operation". 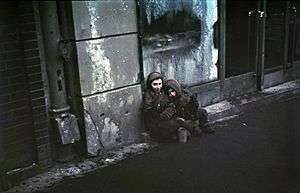 Two Askari or Trawniki guards, peer into a doorway past the bodies of Jewish children killed during the suppression of the Warsaw ghetto uprising. Eichmann and his officers were responsible for the murder of most of the Jewish population in the ghettos of the territory of Czechoslovakia, and for the transport of men, women and children of all nationalities to extermination camps, for example KZ Auschwitz-Birkenau, May–June 1944. 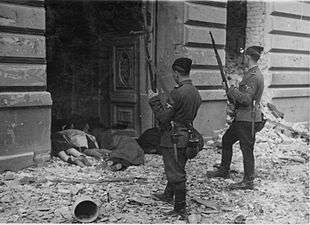 Polish civilians murdered by German SS forces (Oskar Dirlewanger) in Warsaw Uprising, August 1944. 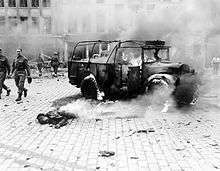 Collecting bodies after bombing, during Warsaw Uprising. Picture of the courtyard of Tamka 23 street where Tomaszewski was taken after being wounded on 8 September 1944. This boy's dead, burning body shows damage done by a V-2 on a main intersection in Antwerp, on a main supply line to the Netherlands, 1944. The bodies of Belgian men, women, and children, killed by the German military during their counter-offensive into Luxembourg and Belgium, await identification before burial, 1944. 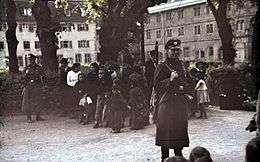 Ghetto Litzmannstadt: Children rounded up for deportation to the Kulmhof extermination camp. Memorial to the murdered children of Lidice. Wikimedia Commons has media related to War crimes. 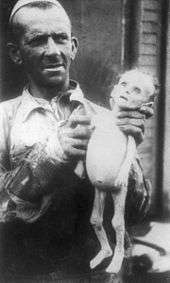 Wikimedia Commons has media related to Child Holocaust victims. ↑ Maltz, Judy (Mar 3, 2011). "A picture worth six million names". Haaretz. Retrieved 2013-07-20. ↑ Levi, Neil; Rothberg, Michael (2003). The Holocaust: Theoretical Readings. Rutgers University Press. p. 465. ISBN 0-8135-3353-8. ↑ Allan D. Cooper (2006-08-31). "Reparations for the Herero Genocide: Defining the limits of international litigation". Oxford Journals African Affairs. ↑ "Remembering the Herero Rebellion". Deutsche Welle. 2004-11-01. ↑ Walter Nuhn: Sturm über Südwest. Der Hereroaufstand von 1904. Bernard & Graefe-Verlag, Koblenz 1989. ISBN 3-7637-5852-6. ↑ Telford Taylor (November 1, 1993). The Anatomy of the Nuremberg Trials: A Personal Memoir. Little, Brown and Company. ISBN 0-3168-3400-9. Retrieved 20 June 2013. ↑ Thomas Graham, Damien J. Lavera (May 2003). Cornerstones of Security: Arms Control Treaties in the Nuclear Era. University of Washington Press. pp. 7–9. ISBN 0-2959-8296-9. Retrieved 5 July 2013. ↑ Logan Marshall (1915). Horrors and atrocities of the great war: Including the tragic destruction of the Lusitania: A new kind of warfare: Comprising the desolation of Belgium: The sacking of Louvain: The shelling of defenseless cities: The wanton destruction of cathedrals and works of art: The horrors of bomb dropping: Vividly portraying the grim awfulness of this greatest of all wars fought on land and sea: In the air and under the waves: Leaving in its wake a dreadful trail of famine and pestilence. Retrieved 5 July 2013. ↑ Chuter, David (2003). War Crimes: Confronting Atrocity in the Modern World. London: Lynne Rienner Pub. p. 300. ISBN 1-58826-209-X. ↑ Willmore, John (1918). The great crime and its moral. New York: Doran. p. 340. ↑ "Home - Veterans Affairs Canada". Vac-acc.gc.ca. 2012-03-29. Retrieved 2012-07-09. ↑ "Complete tabulation of executions carried out in the Einsatzkommando 3 zone up to 1 December 1941". 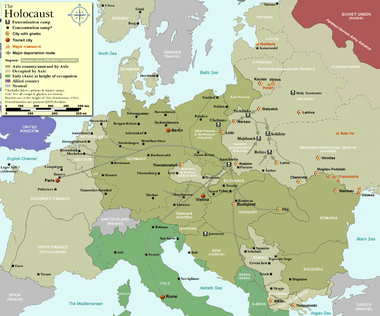 Holocaust-history.org. Retrieved 2012-05-04. ↑ "Gesamtaufstellung der im Bereich des EK. 3 bis zum 1. Dez. 1941 durchgeführten Exekutionen". Holocaust-history.org. 2002-09-28. Retrieved 2012-05-04. Holocaust Memorial Album Honoring more than 1.5 Million Souls Under 12 years of age that never returned ... from Holocaust Survivors and Remembrance Project: "Forget You Not"